Do you want your content to work harder for you? More links, more shares, more traffic? Have you ever poured your heart and soul into an epic post that you feel just didn’t get the attention it deserved? What if that content could have a second chance? Well, the good news is… it can. Today I’m going to share with you a tactic I have used successfully many times in the past to breathe new life into old posts, to pick up fresh links and shares and to get a loads of new eyeballs on content that was previously consigned to wander alone and unloved in the cyber wilderness. And I’ll show you how you can use the same tactic for your own site. So, allow me to introduce content rebirth! Before I take you through the real world example above (from this very site), let me explain the principal behind content rebirth. For any blogger or content marketer, there is a certain thrill to be had every time you hit that blue publish button in wordpress. Your post is good, you know it’s good. Actually, it’s better than good, it’s great. This is going to be the one that propels you into the upper echelons of the blogging fraternity. You’re certain of it. You click the publish button. Your post is live! You tweet it. You share it. 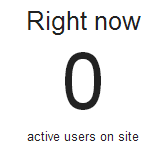 You jump into google analytics real time and wait for the inevitable flood of traffic. And you continue to wait… Surely this can’t be right…? Perhaps the content does take off to an extent, but just doesn’t get the traction and links you feel it’s epicness deserves. So, you swallow your pride, forget about the time you spent putting it together and move on to your next post. The content has fallen victim to the blue publish button of death. That time doesn’t have to be wasted. The post doesn’t have to be dead. If things didn’t take off the way you hoped, but you just know the content is awesome, then don’t forget about it . Instead stick a pin in it (for now). And after at least a couple of months it’s time to revisit that post. It’s time to use the content rebirth process to give it a second chance and turn that blue publish button of death into the update button of life. And voila! The content will be reborn. So now you get the idea, it’s time to walk through a real world example and show you how you can use the process to drive more traffic to your site and pick up fresh links. The post was over 13,000 words long and took me a *long* time to put together. I had originally planned to publish in January, but like I said, it was March before it was ready to be published. It didn’t do too badly. All in, it was viewed 2,978 times between March and May, but as you will see below most of those views happened in the week after publishing and by May traffic was down to a trickle (as can happen with blog posts). It picked up a reasonable number of organic links (2,690 in total from 18 root domains according to Majestic) and also had over 200 social media shares. But, I felt it could do more. You want more traffic? Get more links! You might say. It is true that I could have spent some time outreaching and building links to the post, but I had a nagging feeling that I had made some mistakes with the original article, or certainly there were areas in which it could be improved. So, on the 26th May, I poured a strong coffee, sat down in front of my laptop, pulled the post up and started to analyse why it hadn’t done as well as I had hoped. I then started to make the changes that I believed would give it a second chance. The whole process took just under 4 hours. Before I continue, if you want to view the old post to see what I’m talking about you can bring it up on archive.org here. So, here is how I repackaged and rebirthed the old post. 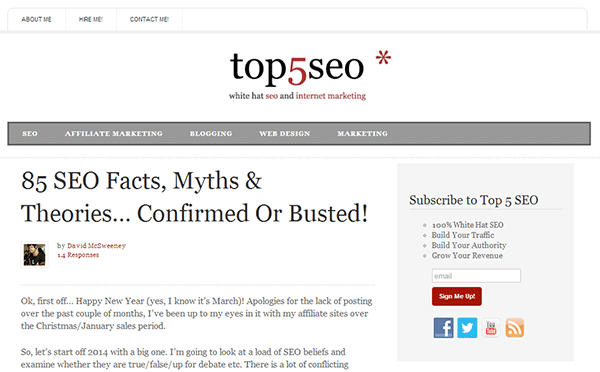 I came up with the idea for the post in early January and it was originally to be called ‘107 Common SEO Myths… Confirmed Or Busted’. I wanted to create a substantial resource on the current state of SEO, running to over 10,000 words and I figured that it would be easiest to digest (and write) if I broke it down into a list format. I also picked the number 107 as an odd number that would stand out and hopefully entice clicks. But now I came to revisit it in May I felt the title just didn’t do the post justice. What I had created was effectively an ‘ultimate guide to SEO’ type post, but I didn’t want to call it that (I kind of hate the ‘ultimate guide’ moniker – what if someone writes a better one is that ultimater?) 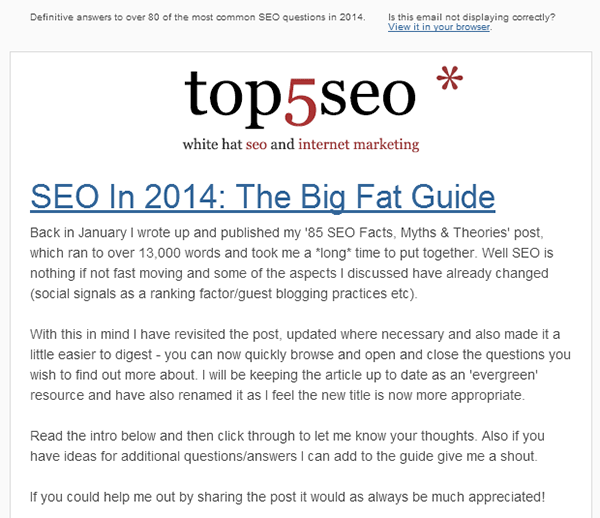 so I settled on a new title of ‘SEO In 2014: The Big Fat Guide’. The title followed the same format as my recently published tutorials, i.e. (Guru Guide To Link Reclamation, Guru Guide To Broken Link Building) and was much more descriptive of the posts content. There was a big problem with the original post. 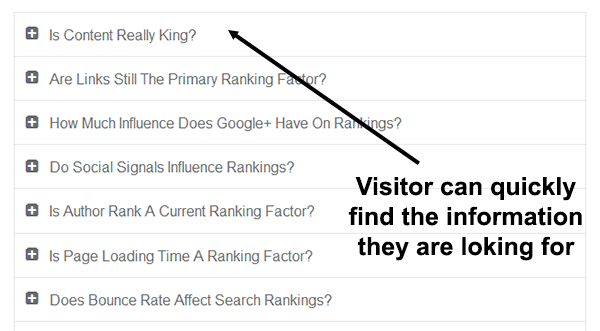 When I started writing the post back in early January, it was generally accepted that social signals were an important ranking factor, however, at the end of January Matt Cutts stated quite categorically that this was not the case. Some of the first ‘myths’ in the article addressed social signals as ranking factors and in my rush to finally publish the post I did not take the time to go back over these and review them before publishing. The content was effectively out of date on publication – a huge faux pas and something I would heavily chastise any other blogger, or writer for. So, sorry about that. As SEO is a constantly moving feast, there were also a few other points for which there was new information, so I took the time to go through all of the points and update them accordingly to reflect the latest thinking and best practices in SEO. immediately dated it and would probably turn off new visitors. I took the time to write a brand new introduction, turning the post into more of an evergreen resource, which is what a post of that detail should be. The header sections of the original post took the format of statements, i.e. ‘1. Content Is King’, which were subsequently either confirmed or falsified. I decided that in it’s new format, the sections would work better as questions, so for example ‘Content Is King’ became ‘Is Content Really King?’ and ‘Links Are Still The Most Important Ranking Factor’ became ‘Are Links Still The Primary Ranking Factor?’. Also, at over 13,000 words, I realised that the post probably suffered a bit from the TL;DR factor. I wanted to make it easier for someone to use it as a resource that they could bookmark then jump in and out of, quickly finding information specific to their needs. So, instead of one long article I used some jquery to set up an accordion style layout where just the questions are shown and a visitor can quickly browse and then click to find the answer they are looking for. Implementing all of the above took around 3 hours and I was very happy with the new format. The post had been rebranded, updated, repackaged and was now ready to be reborn! I had made significant changes to the original post and, although 90% of the text was the same it was in many ways now a radically different piece of content. Based on this I decided to change the publication date to the current date (which was 27th May). I left all previous comments in place. In an ideal world, the url of the reborn content should remain the same, but for this post I felt it had to be updated as it was seo-facts-myths, which was no longer descriptive of the post. I changed it to seo-2014. Important: If you are changing URLs then WordPress automatically sets up redirects for the old URL, but depending on your CMS you may have to manually set up a 301 (permanently moved) redirect. To be crystal clear, the old URL was no longer active and was now pointing to the new URL (or would be as soon as I clicked update). Everything was now ready and it was time to go live. I clicked on update and shared the post in the usual places (twitter, G+ etc). I had 0 unsubscribes, which shows that my honest approach was appreciated. If you’re not signed up already by the way, you can do so below. So how did the reborn post too? Well, in the 3 weeks after going live it was viewed a total of 1,844 times. In the 3 weeks prior to updating, the facts and myths post had generated just 309 views – giving an increase of 496%. 1 month after publication the post continues to receive around 60 new visits a day. At the time of writing, majestic SEO shows 64 new links from 16 referring domains. These links were all completely organic, many of them being ‘best posts this week’ type roundups. For example, the guide was featured in Matthew Woodward’s best of Internet Marketing May 2014 roundup (thanks Matt!). I am also aware of at least 5 more linking domains that are not currently reported by majestic (you can see several of them in the trackbacks on the post). The updated post has (so far) received 405 shares across twitter, facebook, g+ and linkedin. It continues to pick up new tweets/shares etc every day. As you can see, second time round the post is performing much better and bringing in consistent traffic. As it is now an ‘evergreen’ resource it will continue to pick up citational links and shares and is also ripe for future outreach. It was important that I was self critical and spent the time working out where I had gone wrong first time round. 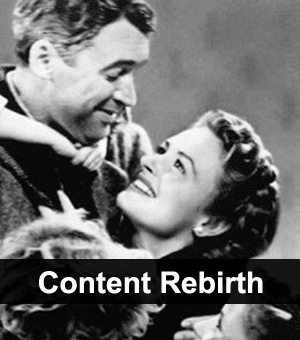 Content rebirth is a great way to breathe life into old content, but be selective. While the tactic works very well, it is not something you should overdo – I would recommend repurposing a maximum of 2 or 3 posts a year. That’s not to say you shouldn’t update old posts to keep them up to date (you definitely should), but for a full rebrand/repackage/relaunch exercise you don’t want to overdo it and it is important that you continue to put out fresh content for your audience. How Will Use Content Rebirth? Hopefully my example has given you some ideas of ways you can use this simple strategy to increase traffic to your own site. I’d love to hear about your ideas, so please leave a comment below. Also, if you have already used the tactic, then let me know how you got on. As always, any questions just leave a comment or drop me an email. Maybe, but probably not. After all, your research is solid: you know these blogs are writing to the sames kinds of readers you’d like to have on your email list. Nice. Many will definitely apply this on their post article. Thanks a lot.